Knowledge and Wisdom are two qualities which can be passed through generations and it can be multiply as many times one wish to. Quality books, magazines and for that matter all other media help us to preserve this ocean of resources. It is up to us that how we can use it to analyze, learn and have its effect on our important decisions in our life. There are thousands of magazines published every month, some of them are quite worthy your money and most importantly your time. Safari is one such knowledge oriented magazine. 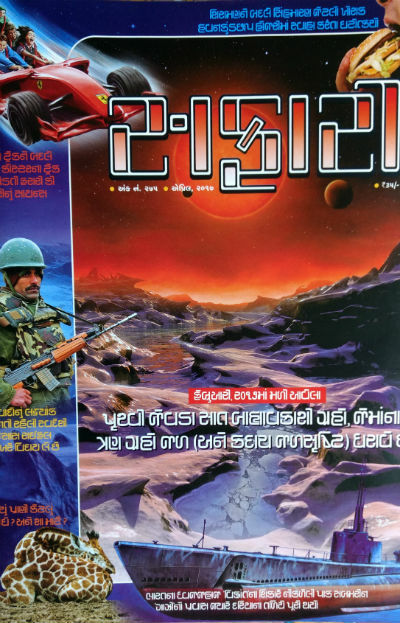 Though it’s English edition couldn’t survive, it’s Gujarati edition is circulating in satisfactory numbers. May 2017 issue of Safari magazine published almost on time (in the beginning of this month). And, here are our personal, unbiased and genuine reviews for the same. First thing always comes first right (that’s why it is first:)? Any magazine’s first impression is created by the cover of the same. And as you can see, the cover page is quite interesting. Almost all cheery colors and a person jumping from a multi-storey building which was caught in a mishap makes it more interesting. It definitely makes us curious to learn more about movie stunts and the science behind that. Actually, the themed article is on the same topic, but, we will talk about the editorial of this issue first. While the citizens feel disgusted for the barbaric act of Naxalites in recent past (where they trapped a group of CRPF and brutally killed them), and politicians are giving their reactions; the editor wrote a small yet thoughtful article in the form of the editorial here. It is worth to read. Can someone fight on a train moving so fast without being fell down? Or for that matter, is it possible to jump forward on the roof of a running train? One other breath taking scene is when SupermanJackie Chan, one of the fe movie actors who actually does his own stunts. He has a record of breaking almost every major bone of his body during filming various movies. If you are a movie lover, you will definitely like this article. However, you will be little disappointed too! Because you always want to know more from the science and knowledge perspective about many other movie stunts. There is one small yet important article (or rather say a news item) mentioned in the magazine which is worth taking note of. Air Taxi is considered as a SciFi stuff. But, it is going to be started soon in real in Dubai! Yes, being an economic hub Dubai is facing the problems of such place as well. So much traffic makes people spend a remarkable amount of time to reach to their workplace (and return to home). So the authorities have taken some serious action and implemented a course to actually use flying cars as a taxi. We actually feel that the topic is so vast, a detailed article can give better justice to it. The single page news item is worth to read for sure. Here are some external links you will like to explore to know more about it. We have heard and read a lot about Pakistan and it’s political situations. Everybody knows that since the death of M A Jinnah, the country was always looking for a unanimously accepted leader who rule the heart of Pakistani Citizens. How eventually the armed forces of Pakistan got more and more control and how it affected to the economy of that country is a good analytical study explored in this issue. Ace author Nagendra Vijay is known for his unique style of writing and the authenticity of the stuff he wrote about. His analytical study is backed with some historical incidents and financial facts. How it affected the country and especially its middle class and lower-middle-class citizens, is worth to read about and learn from. The article is written with the pure analytical point of view by keeping the hatred away. The article also summarizes that why Indo-Pak peace talks fail despite genuine attempts from the Indian government. A good article to go for, for sure. There is a very good article about the Science of Synchronisation by B. M. Purohit. The article starts with an example of synchronization of blinking their lights by glow-worms. How is it possible, that, sometimes thousands or even more glow-worms flash their light at the same time in a synchronization?! The article then moves ahead and talks about how people walking in a group subconsciously follow synchronized walking pattern. Here is an interesting video in the same regards, by National Geographic. A good article which makes you feel that some facts are stranger than the fiction, indeed. The most wide used paper size around the world is A4. But why this size is chosen and became a standard, especially more due to computerisation. An interesting article by D. N. Kaushik gives you some good information about it. In addition, there are regular sections and good Q/A available inside which makes worth reading it. If you want to beat the heat in this summer by learning something new and curious to feed some quality knowledge in your brain, you should go for it. The only limitation is, it is published in a regional language, making it’s reach limited.